How Much Do Hamsters Weigh? Some adult hamsters weigh as little as half an ounce, and some weigh as much as 10.5 ounces. 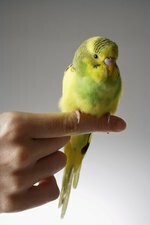 Of the five species that are commonly sold as pets, the Syrian hamster is the largest and the Roborovski hamster is the smallest. Hamsters are fully grown at about 6 months of age; at 18 months of age -- when hamsters enter old age -- their weight may decrease. Syrian hamsters are usually golden brown and are also known as golden hamsters. These hamsters generally weigh about 1 ounce for each inch of their length, which is 6 to 7 inches. Campbell's Russian dwarf hamsters have red or black eyes and weight about 1.5 to 1.7 ounces. Winter white dwarf hamsters are so named because during the shorter days of winter, they acquire a dusting of white fur over their coat. This species weights 1.5 to 2 ounces, on average. Chinese hamsters are not pudgy like other hamster species; rather, they are long and thin. They also have lengthy tails compared to other pet hamster species. Chinese hamsters weight 1.5 to 1.75 ounces. Roborovski hamsters are not only the smallest species, but they are also the fastest. They are affectionately called "Robo" hamsters. Robos average .75 to 1.5 ounces in weight. When you weigh your hamster on a regular basis, you will know your hamster's normal weight and be able to recognize any rapid weight gain or loss that could indicate a health issue. Knowing your hamster's normal weight and reporting any changes will also help your vet diagnose potential problems. Use a digital postage or kitchen scale. Weigh your hamster in a small box so he doesn't walk right off of the scale. Remember to weigh the box first and subtract the weight of the box from the weight of your hamster when he is in the box. 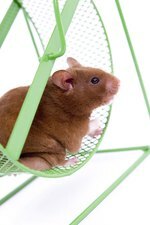 Weigh your hamster at the same time every day, because his weight can fluctuate throughout the day by about 0.2 ounces.